wooden ships comments on this Morgan Giles rowing dinghy in immaculate condition having just finished a professional refit. Totally rebuilt by present boat builder owner to an exacting standard, with the majority of work completed in 1992. Stored indoors and launched for occasional use. Built by Morgan Giles himself, supposedly when he was an apprentice. Planked in 5/16″ larch fastened with copper nails and roves to steam bent oak timbers. Oak back bone, stem and transom with elm garboards. Varnished mahogany shearstrakes and gunwhales. 80% of planking and all oak timbers replaced during the refit. Two rowing positions with a pair of varnished spruce oars. This fine little dinghy rows extremely well with her lovely run of planking. 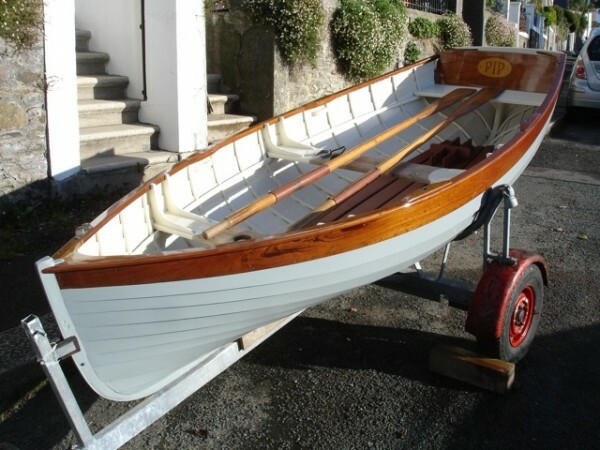 it is thought she was probably a Shaldon race boat, hence the reason why she was built so light. There was, and still is, a strong tradition of racing rowing boats in Teignmouth, stemming from the sein net fishing boats that worked off the beach. It would be hard to find a smarter or prettier rowing boat.